Sew what's cooking with Joan! 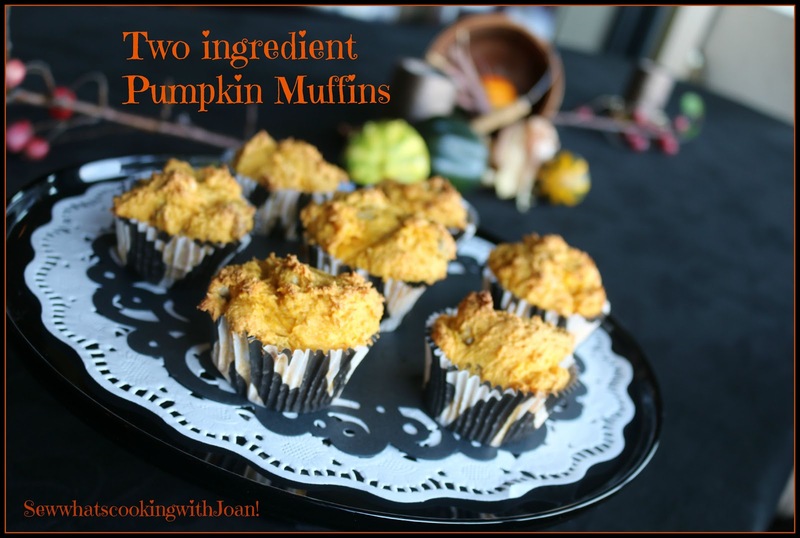 : Easy two ingredient "Pumpkin muffins"! The other day, I had some unexpected company and needed a quick breakfast muffin. At first I thought I'd run to the local bakery, then I remembered "THE" pumpkin muffins. It had been years since I made them! It was back in the days BEFORE Pinterest and Facebook! Yes, my fellow internet addicts, we did have a way of exchanging recipes back then. Pumpkin muffins have two ingredients. It seems like overkill to do the step by step but, heh, why not! 1/2 c. Chopped Walnuts, pecans or 1/2 c. raisins, craisins, coconut or currents....you can even glaze them if you would like! In a large bowl mix the pumpkin into cake mix, combining the ingredients. Add in optional ingredients. Stir. Drop by spoonfuls into prepared muffin tins. If not using liners, be sure to spray the pan with a non-stick spray first. 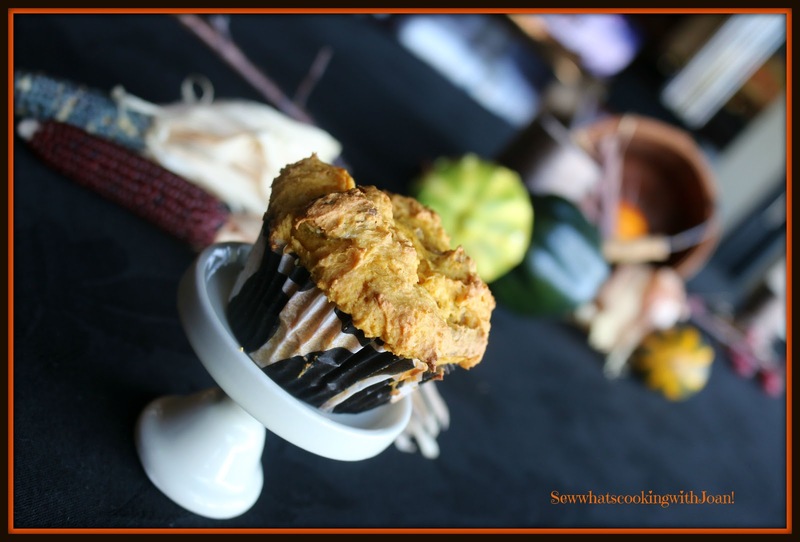 Never easier 2 ingredient pumpkin muffins, tender, moist and delicious. Hard to believe it's literally only 2 ingredients!! Wee Bear and I are off to France on a 2 week road trip through all the wine regions!! 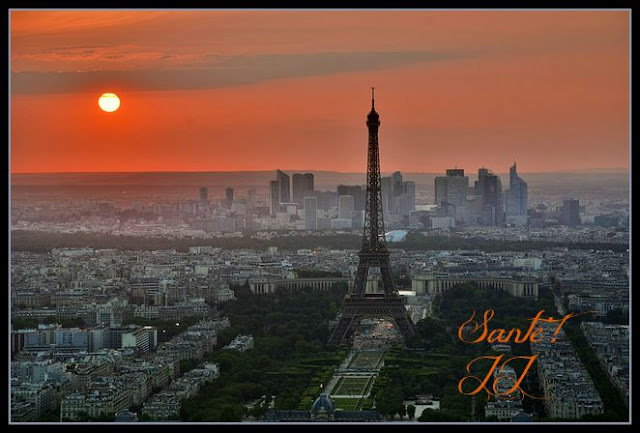 When you see this post which was written in advance, we will be enjoying some delicious French wines in Bordeaux and 1, 2 and 3 star restaurants. We are also visiting the Rhone Valley and Burgandy! We are with 6 other couples and a guide. Each of us have a BMW loaned to us from BMW France, so these are car people!! What is not to like here? Cars, autobahn, wine and food! Oh, and the guide has a van to transport us to and from dinners!! Perfect! I will have plenty to report and will take lots of pictures....promise!